Juanita Ulate Garcia left this earth to join her beloved husband, Raymond Garcia, on March 30, 2019. Juanita was raised on a ranch in Arizona with her two brothers, Joe and Manual, and came with them to California at an early age. Four more siblings came into her life in California. She was blessed with the opportunity to meet a long-lost sister, Licha, in adulthood. They quickly developed a close bond. 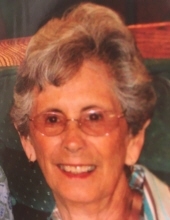 Juanita spent her teen years working in the fields, frequenting neighborhood dances and building a life-long community of friends and family. She married the love of her life, Ray, in 1951 and settled into a life as wife, mother and grandmother. She worked for many summer seasons at Libby’s Fine Foods and in 1981 moved to Modesto to follow Ray’s job. In Modesto she made new friends and quickly became known as the neighborhood grandma. She is survived by her two daughters, Cecilia Garcia and Vivian Olmos (Frank); granddaughters, Melissa (Dan), Alicia, Marie, Olivia and Rayna; siblings Joe, Manuel, Ralph, John, Bobby, and Jovita. She is preceded in death by her husband, Ray, and her sister Licha. In lieu of flowers, please make donations to the Alzheimer’s Foundation at Alz.org. To plant a tree in memory of Juanita Ulate Garcia, please visit our Tribute Store. "Email Address" would like to share the life celebration of Juanita Ulate Garcia. Click on the "link" to go to share a favorite memory or leave a condolence message for the family.